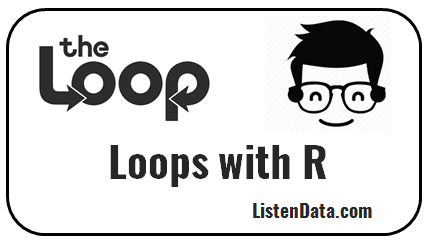 This tutorial explains how to write loop in R. It includes explanation of APPLY family of functions and FOR LOOP with several examples which makes writing R loops easy. Loop helps you to repeat the similar operation on different variables or on different columns or on different datasets. For example, you want to multiple each variable by 5. Instead of multiply each variable one by one, you can perform this task in loop. Its main benefit is to bring down the duplication in your code which helps to make changes later in the code. They are the hidden loops in R. They make loops easier to read and write. But these concepts are very new to the programming world as compared to For Loop and While Loop. It is used when we want to apply a function to the rows or columns of a matrix or data frame. It cannot be applied on lists or vectors. In the second parameter of apply function, 1 denotes the function to be applied at row level. In the second parameter of apply function, 2 denotes the function to be applied at column level. When we apply a function to each element of a data structure and it returns a list. The function(x) is used to define the function we want to apply. The na.rm=TRUE is used to ignore missing values and median would now be calculated on non-missing values. In this case, we are adding 1 to each variables and the final output would be a list and output is shown in the image below. Sapply is a user friendly version of Lapply as it returns a vector when we apply a function to each element of a data structure. The above function returns 1,1,0 for variables x,z,y in data frame 'dat'. In this example, sapply(iris,is.numeric) returns TRUE/FALSE against each variable. If the variable is numeric, it would return TRUE otherwise FALSE. Later, which function returns the column position of the numeric variables . Try running only this portion of the code which(sapply(iris,is.numeric)). Adding colnames function would help to return the actual names of the numeric variables. In this example, we would show you how both lapply and sapply are used simultaneously to solve the problem. The following code would convert all the factor variables of data frame 'dat' to numeric types variables. Converting only those variables wherein index=TRUE. Like apply family of functions, For Loop is used to repeat the same task on multiple data elements or datasets. It is similar to FOR LOOP in other languages such as VB, python etc. This concept is not new and it has been in the programming field over many years. Prior to starting a loop, we need to make sure we create an empty vector. The empty vector is defined by x=NULL. Next step is to define the number of columns for which loop over would be executed. It is done with ncol function. The length function could also be used to know the number of column. The vector function can be used to create an empty vector. The seq_along finds out what to loop over. The program below creates multiple data frames based on the number of unique values in variable Species in IRIS dataset. It returns three data frames named iris.1 iris.2 iris.3. In the example below, we are combining / appending rows in iterative process. It is same as PROC APPEND in SAS. do.call() applies a given function to the list as a whole. When it is used with rbind, it would bind all the list arguments. In other words, it converts list to matrix of multiple rows. In this case, we are first creating an empty table (data frame). Later we are appending data to empty data frame. Suppose you are asked to impute Missing Values with Median in each of the numeric variable in a data frame. It's become a daunting task if you don't know how to write a loop. Otherwise, it's a straightforward task. In the program below, which(sapply(dat, is.numeric)) makes sure loop runs only on numeric variables. Calculate Z-score i.e. subtracting mean from original values and then divide it by standard deviation of the raw variable. Make names of variables based on original names. For example x1_scaled. In this case, do.call with cbind function helps to make data in matrix form from list. A while loop is more broader than a for loop because you can rescript any for loop as a while loop but not vice-versa. The double percent sign (%%) indicates mod. Read i%%2 as mod(i,2). The iteration would start from 1 to 6 (i.e. i<7). It stops when condition is met. "1 is an Odd number"
 "2 is an Even number"
 "3 is an Odd number"
 "4 is an Even number"
 "5 is an Odd number"
 "6 is an Even number"
When a loop encounters 'break' it stops the iteration and breaks out of loop. In this case, as condition i+j >4 is met, it breaks out of loop. When a loop encounters 'next', it terminates the current iteration and moves to next iteration. If you get confused between 'break' and 'next', compare the output of both and see the difference. 1 Response to "Loop in R"
For example, data$variable won't work inside the code . Instead we should use data[[variable]]. data$Species when I am accessing inside function is working.